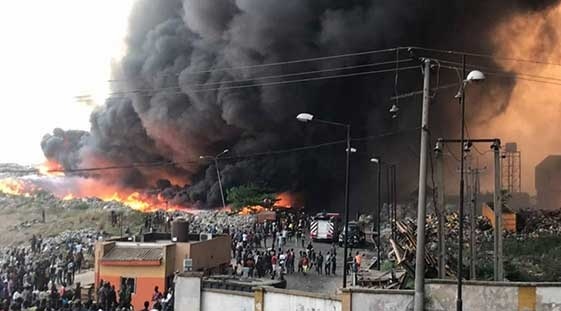 The Cleaner Lagos Initiative (CLI) on its website said it is necessary to clarify that the fire at Olusosun dumpsite was not arson. It said fire broke out as a result of pockets of unstable gases caused by indiscriminate dumping which was further compounded by the dry weather. “It is important to note that a major aim of the Cleaner Lagos Initiative is to eventually shut down the unsanitary dumpsite at Olusosun. “The government is well aware of the risk of having such a massive, unsafe, and unsanitary landfill so close to residential areas. “This is why under the CLI, three Engineered Landfills in Epe and Ikorodu have been concessioned for construction and maintenance. “We expect for the first to be fully operational by early 2019, although it is already being used as a viable alternative to these dumpsites,” it said. The government had through an Environmental Utility Firm, Visionscape Sanitation Solutions, commenced the construction of the first engineered sanitary landfill in Epe.